Hi everyone! It’s Rachel, one of your Team LC editors. 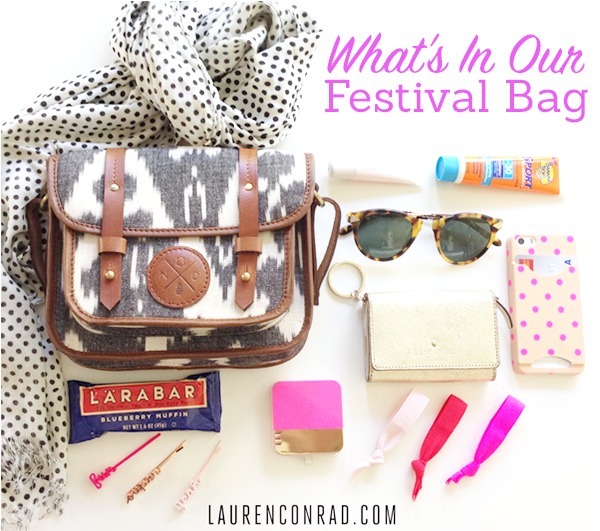 Festival season is finally upon us, and here at the LC.com HQ we could not be more excited. There are so many fun music festivals in California (Coachella and Stagecoach, anyone?! ), and we plan on attending as many as we can. There’s nothing quite like spending a long weekend with good friends, endless sunshine, and live music. The first festival on our schedule this year is Coachella, which is in the desert about 2 ½ hours east of Los Angeles. Personally, I’m a big fan of this festival because the weather is usually warm, the scenery is absolutely stunning (think palm trees, mountains, and clear blue skies), and the music is incredible. It’s truly an experience. The first (and most important) thing to make sure you have before heading out to a music festival is a stylish and sturdy cross-body bag. I plan on taking my Ikat Satchel from The Little Market with me when I head to the desert. It will go with any outfit I wear, and it’s big enough to fit my essentials but small enough that I can frolick around the festival grounds all day without it hurting my back. A chic pair of sunnies is a must for any music festival. Especially at Coachella, when the temps can hit 100 degrees and the sun can be brutal, protecting your eyes is crucial. These Ray-Bans are my favorite for festivals. They’re really lightweight, match anything and everything, and will shield the sun till it goes down. Your phone (and a phone case that will protect it) is necessary at any large event like a music festival. If you want to meet up with friends, snap some festival ‘grams or check the lineup (most festivals have free apps that you can download to follow which bands are playing when and where), make sure you keep your phone nearby. When space is limited in my bag, I love a phone case like this one from Ban.do. Not only is it ridiculously cute, but it also has a spot for your credit cards and ID. If you can fit everything in your iPhone case (like this one), then you might not need a mini wallet. But for those of you who need a pouch to keep your ID/cash/cards/etc., one of these little guys from Kate Spade is perfect. It’s super small, so cute, and will keep your cards and cash organized. At a warm weather festival, keeping your lips moisturized is very, very important. Throw a couple of your favorite lip balms in your bag and lather them on all day long. My favorite is this one from Jouer. It gives a little hint of color, seriously moisturizes, and leaves your lips feeling (and smelling) amazing. Hair Ties & Bobby Pins . For festivals, I usually opt for a ballerina bun. It keeps my hair up and out of my face (which is a must for those 100-degree days). Wind can also be an issue, so keeping your hair up in a tidy bun can save you from majorly tangled tresses. Because you never know when you’ll need some extra help keeping your hair in place, I always keep some cute Ban.do hair bands and bobby pins in my bag. While some festivals won’t allow you to bring in your own food (check the festival website for info on this), I highly suggest bringing in snacks if you can. While there’s always food that you can buy, bringing in a protein bar or little snack of your own can save $$$ and re-energize you if you feel like you’re fading (which is bound to happen at an all-day festival). I make sure to pack Larabars. They taste amazing, have tons of protein, and are the perfect way to nourish and energize in a pinch. Back Up Charger or Charging Cords. These days, I never leave home without a back-up iPhone charger. And when I’m heading to a festival, this is one of the most important items that I’ll throw in my bag. The last thing you want is for your phone’s battery to run out after you’re separated from your friends (or your ride). It’s just a bonus when your back-up charger is as adorable as this one from Ban.do. For those of you who don’t have a back up charger, squeezing in a charging kit is also a good idea. There’s nothing worse than a painful, skin damaging sunburn. Protect yourself against advanced aging, dangerous UV rays and those uncomfortable burns by lathering on the sunscreen. Even if it’s cloudy or you don’t think you’ll get burned, it’s better to be safe than sorry. My favorite is this one from Dior. It smells delicious, protects your skin and moisturizes all at the same time. I always tie a scarf to the strap of my bag before I head to any music festival. A big, cozy scarf can act as a blanket to sit on during the day and will also keep you warm when the sun goes down. I’ll be taking this one from The Little Market with me. Are you heading to any music festivals this year? If so, what essentials will you pack in your bag? Also, let us know who you’re most excited to see play this festival season in the comments!